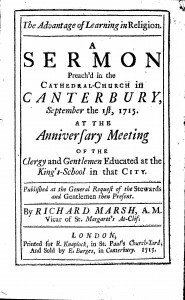 The Society of Gentleman Educated at Canterbury School, usually known as the Feast Society, was founded in 1712. The gentlemen attended a service in the Cathedral, then Speeches (see Speeches in the Chapter House) and finally had a fine dinner. They raised money to award exhibitions for boys going to university. In 1864 their role was taken over by the Exhibition Fund Committee. The first sermon, forerunner of today’s Commemoration Day sermon, was preached by the Headmaster, the Revd. John Smith, in 1714. The sermon illustrated was the first to be printed. The publisher was Robert Knaplock OKS, a London bookseller, later Master of the Stationers Company. The Canterbury bookseller Edward Burges, noted on the title page, was also an OKS. 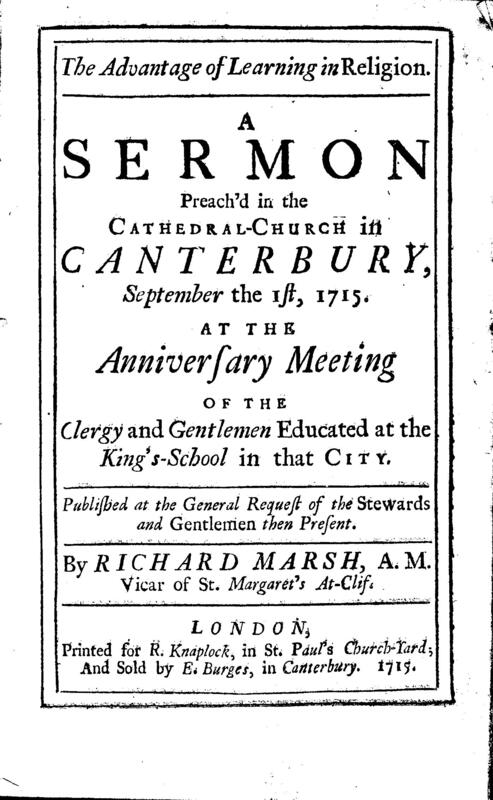 The preacher, Richard Marsh, had been a King’s Scholar from 1680 to 1685 and was Vicar of St Margaret-at-Cliffe. His sons also came to King’s. The full list of preachers can be seen here: Speech Day Preachers.